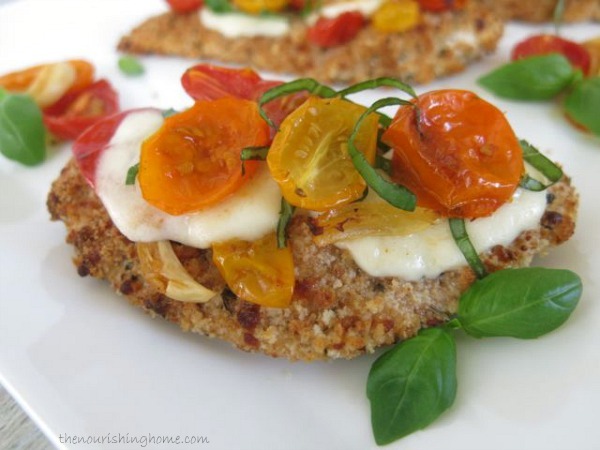 We love this tasty twist on classic Chicken Parmesan! It’s a unique twist indeed! I’ve nixed the thick marinara sauce typical of Chicken Parmesan and replaced it with savory roasted tomatoes tossed with garlic and thyme. I wish you could reach right through the screen, grab one of these little roasted tomatoes and pop it right into your mouth. Yum! I love roasting veggies, it’s such an easy way to intensify their flavor. 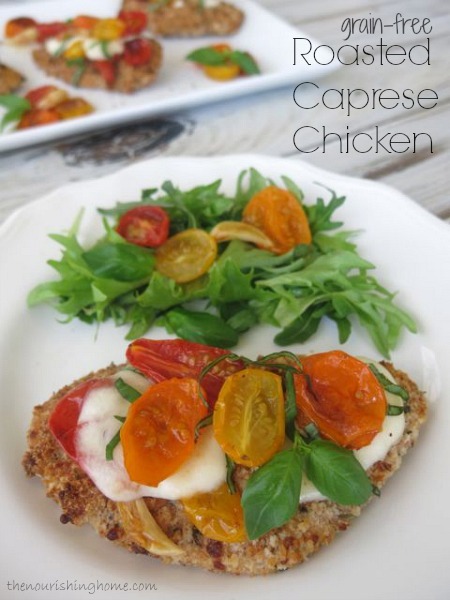 This is especially true of tomatoes – their flavor becomes more concentrated, which gives this Roasted Caprese Chicken dish a savory burst of tomato flavor with every delicious bite! Often, when I make this dish, I’ll double the tomatoes and divide them among two baking trays. I’ll bake one tray for use in this tasty dish. And then, I’ll pop in the second tray to roast for even longer – until the tomatoes are just barely moist in the center (about 35-45 minutes). I cannot even describe to you how delicious they are – think sundried tomatoes so rich in flavor that you will never-ever buy them from a store again! These ultra-roasted little beauties can be placed in a mason jar, topped with EVOO and stored in the fridge. Roasted tomatoes are the perfect addition to sandwiches, pasta (zoodles), salads, egg dishes and roasted meats. Of course if you double-up on the tomato roasting, just be sure not to crowd the little guys. You’ll want to leave enough room between the tomatoes so the moisture can escape, which intensifies their flavor. And if you use a metal pan, be sure to line it with parchment so it doesn’t react, since tomatoes are acidic. For the Roasted Tomatoes: Preheat oven to 400°F. Line a rimmed baking sheet with parchment; set aside. Cut the tomatoes in half and place in a medium bowl. Add the olive oil, garlic, thyme and salt; toss well to combine. Evenly distribute the tomato mixture on prepared baking sheet. Bake 18-20 minutes, until tomatoes begin to wrinkle and juices are bursting. While the tomatoes are roasting, prepare the chicken per instructions below. Then transfer the roasted tomatoes back into the medium bowl. Add the sliced basil and balsamic vinegar; tossing gently to combine. Set aside. For the Chicken: Be sure oven is preheated to 400°F. Line a baking sheet with parchment; set aside. In a wide shallow bowl, whisk the eggs until slightly foamy. Add the chicken. 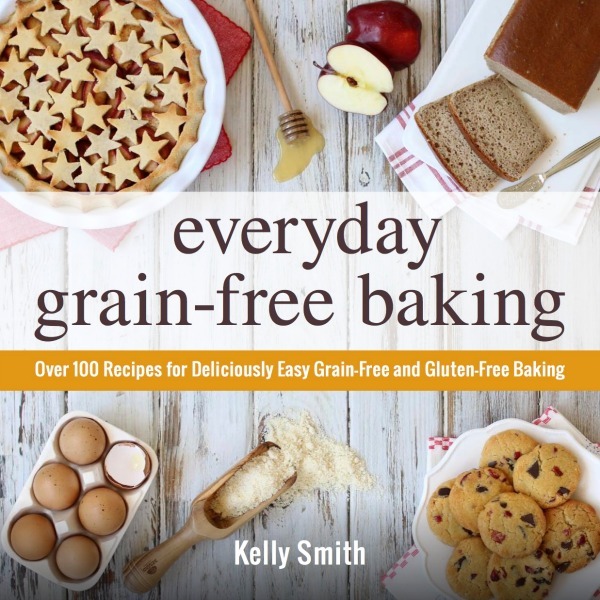 On a large plate, combine the almond flour (or GF breadcrumbs), Parmesan cheese and seasonings. Coat the chicken in the egg wash, one piece at a time, and dredge through the flour mixture, making sure to thoroughly coat each side. Place chicken on prepared baking sheet, sprinkle with an extra pinch of salt and bake approximately 15-18 minutes, until cooked through. Remove chicken from oven. 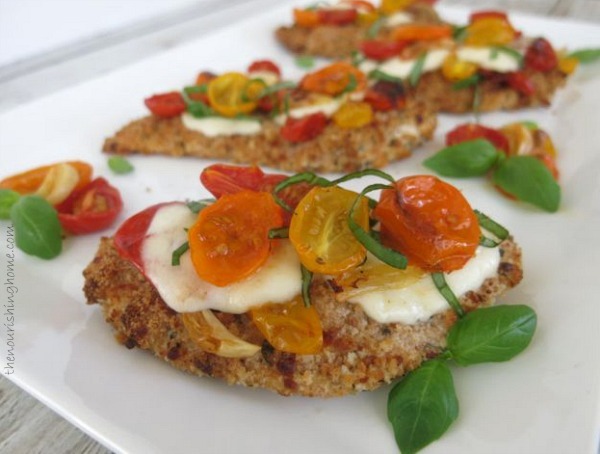 Using a slotted spoon, add 1-2 spoonfuls of the roasted tomato mixture to each chicken breast and top with a slice or two of mozzarella, if desired. Set oven to broil and broil chicken for 1-2 minutes, until tomatoes are slightly browned and cheese has melted. Serve with a side of dressed mesclun greens, or over your favorite pasta or zoodles. Absolutely delicious! What a fabulous idea, especially as we enter the warmer weather! I’ll be sure to give this a try soon!